The Voyage of the Beagle is the title most commonly given to the book written by Charles Darwin and published in 1839 as his Journal and Remarks, bringing him considerable fame and respect. This was the third volume of The Narrative of the Voyages of H.M. Ships Adventure and Beagle, the other volumes of which were written or edited by the commanders of the ships. Journal and Remarks covers Darwin's part in the second survey expedition of the ship HMS Beagle. Due to the popularity of Darwin's account, the publisher reissued it later in 1839 as Darwin's Journal of Researches, and the revised second edition published in 1845 used this title. 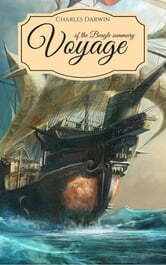 A republication of the book in 1905 introduced the title The Voyage of the "Beagle", by which it is now best known.